Well, I didn't really go to the UK. It was more of a virtual thing. I've been using my Tumblr to get word out lately, because my host provider suffered DDoS attacks over the last few weeks. Things seemed to have settled down now, so we'll see how it goes. 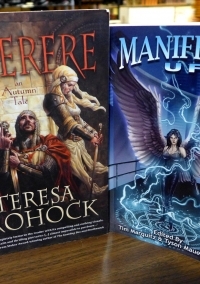 Pat Rothfuss is hosting his annual fund drive for Worldbuilders, and I have donated a signed copy of Miserere and a signed copy of Manifesto: UF, which contains my short story, "Naked the Night Sings." Both of these items are in the Lottery Library. Pat talks about Worldbuilders and how you can donate at his blog. I visited Mark Lawrence at his blog and talked about how women are marketed differently than men in addition to a lot of other things. As an addendum to that interview: Someone compared the use of religious iconology in Miserere to Christopher Buehlman's Between Two Fires. Out of curiosity, I got my hands on a copy of Between Two Fires and I am currently reading it (for the record, I am enjoying it immensely). Oddly enough, Buehlman has a child character in his novel and I don't see any YA comparisons being made. Personally, I think that Buehlman's work is more comparable to my Garden in Umber in respect to the time period, knights, and the use of angelology as a backdrop for the story. Now I'm more convinced than ever that women are expected to write within certain themes and not move outside the YA/PNR spectrum without forfeiting their "marketability." 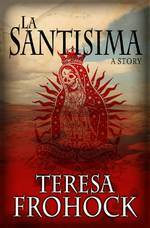 Speaking of marketability ... my short story "La Santisima" is still free and is now on Goodreads if you want to read it, comment, or rate it. I warn you, though, "La Santisima" is very different than some of my other short stories, so your mileage might vary significantly as to whether or not you like it. It was an interesting exercise for me and I learned a lot by working on it. The most amazing Sarah Chorn, who hosts the blog Bookworm Blues, also writes a series of posts for SF Signal. Sarah and I traded emails for several weeks and you can see the results of our discussion at her on-going series, Special Needs in Strange Worlds. I talk about why Glokta is one of my favorite characters and the importance of portraying disabilities realistically in my own stories. It was a fun interview and Sarah is a skilled interviewer. I'm spending my "vacation" fine-tuning the first part of Cygnet Moon and outlining the last half of the story. The novel is coming along very nicely, and I'm pleased with the tone. That is all that I have for you now. There will be more fun and games in the New Year, so stay tuned.